Tough, brainy alchemist Sydney Sage and doe-eyed Moroi princess Jill Dragomir are in hiding at a human boarding school in the sunny, glamorous world of Palm Springs, California. The students--children of the wealthy and powerful--carry on with their lives in blissful ignorance, while Sydney, Jill, Eddie, and Adrian must do everything in their power to keep their secret safe. But with forbidden romances, unexpected spirit bonds, and the threat of Strigoi moving ever closer, hiding the truth is harder than anyone thought. Populated with new faces as well as familiar ones, Richelle Mead's breathtaking Bloodlines series explores all the friendship, romance, battles, and betrayals that made the #1 New York Times bestselling Vampire Academy series so addictive. In this second book, the drama is hotter, the romances are steamier, and the stakes are even higher. Having read and loved Bloodlines (read my review here), I felt sure that I would feel the same way about The Golden Lily. And I'm happy to say that for the most part, I liked it just as much as Bloodlines. Don't get me wrong, this series is not Vampire Academy for me, but I do like it a lot in its own right. I read Bloodlines solely for the hope of seeing Rose and Dimitri in their happily ever after, but found myself invested in Sydney's story. The world of the Alchemists is so interesting, and I love seeing the vampire world through a human's eyes. I was not crazy about Sydney as the narrator in Bloodlines. Thankfully, she really grew on me throughout The Golden Lily. She really is Rose's opposite, and it was hard to let go of my expectations of having Rose for the heroine. My main complaint about Bloodlines was Sydney's focus on her weight. She obsesses over her size, constantly bemoaning the fact that she is a size four and not a size two or smaller. (Since when is a size 4 big?!) She counts calories and restricts her food intake, in order to maintain her weight. I hate reading about this kind of negative body image, especially in a YA novel. Beyond my complaint, I really enjoyed The Golden Lily. I like where Mead is taking the story, and thought that the signature "Mead style" was definitely present. By "Mead style," I mean that the story moved quickly, there were plot twists to keep things interesting, and lots of emotion throughout the book. It's interesting how different people react differently to things. I love Sydney - I think better than Rose, because I relate to her. Especially the unhealthy obsession about weight. 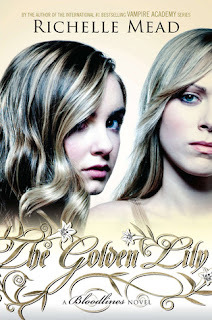 I'm so excited to read Golden Lily. I may have liked Bloodlines even more than VA.
Adrian did talk to Sydney about her issue, so I think she is finally seeing, or letting herself know she does have a problem. I'm okay with this issue in the book, Sydney needs a flaw in her perfect compartmentalized world. I LOVE this series!!! Since I hadn't read VA before I read Bloodlines and TGL , I decided I needed to know more backstory, see how Adrian and Syd fit in and such. So I read the whole VA series and I have to say that I love the spin off series more. Maybe because I read Bloodlines & TGL first. Maybe because I like Sydney and Adrian so much. Maybe because as mush as I liked Rose, Dimitiri always seemed like an enigma and one without real character flaws. This is - hands down - my new favorite book of 2012! My only complaint about Golden Lily is that it caused me to lose sleep. I finished this book in one day...and what an emotional day that was!